The leaves are on the ground now so I guess it's safe to say fall has finally arrived. We saw a very extended summer that lasted well into October. The extreme dry conditions we faced in September were very interesting to say the least. I learned a great deal about both Fusarium and Dollar Spot and the conditions that favour these fungal organisms. Early September saw the overnight temperatures finally start to drop down to reasonable levels. My original Fall disease management plan was put in jeopardy in early September due to a sprayer breakdown. I'm not sure if it was a coincidence or what but about a week after stopping my disease management program Fusarium started to show up on a few of my greens. It was in the usual spots at first but quickly spread out on all but 5 of our 12 greens. The greens where it wasn't located were the greens that received the most sun which wasn't surprising. The first signs of the fusarium showed up on the 5th of September but I was able to hold off a Fungicide spray until the 25th as the fusarium was very slow growing and not very aggressive. For the most part the turf was still able to outgrow the disease on my putting greens. It's important to note that in my writing I am not considering Civitas as a fungicide even though it is registered as one. It doesn't act directly on the fungus but stimulates the plant's natural defence systems. I still apply it according to label rates and all that but the more I use the product the more I am starting to realize all the benefits it has to offer. I was putting Civitas down weekly at 1/4 label rates or about 0.125 ml Civitas/100m2. So on the 25th I applied Triton, a group 3 DMI to the affected greens at the label rate. In the past I had very poor success with this product and the product that I had in stock was leftover from a previous application the year before that had almost no impact at all on the Fusarium. 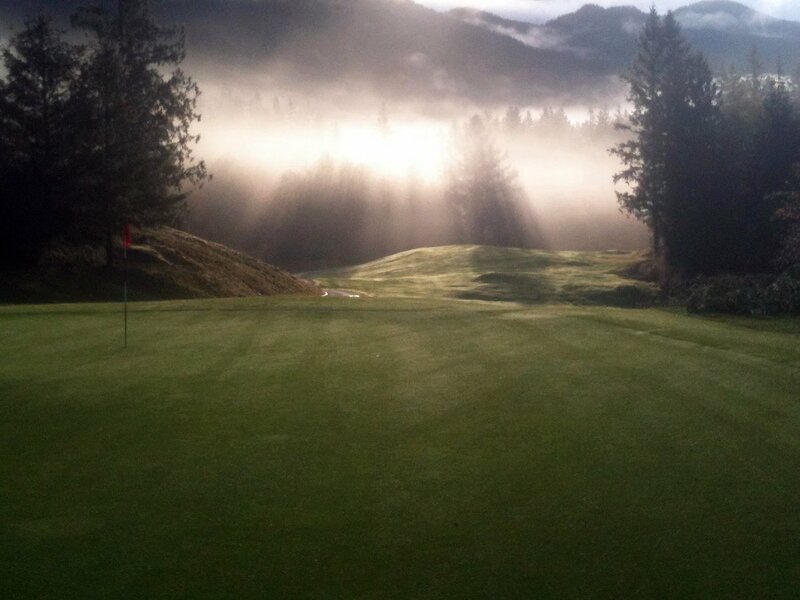 What was interesting was that this product coupled with Civitas produced amazing results. A day after application there was no sign of mycelium where the day before the greens were fuzzy white! I was seeing curative results from a product that in the past I hadn't seen any results at all from. Of course there are other factors such as the weather, and the raise in HOC the week before but overall I was amazed. I put down some knock out trials as usual to see how the untreated areas would manage. So far every untreated plot has fully recovered from any damage that might have occurred All in all there was virtually no damage on any of the plots. You might ask why I applied the Triton in the first place then? Well when you see disease like the following picture on the entire green you cannot afford for it to get any more aggressive. Today it has been 44 days since the Triton application and the disease level is still very low. Since that time I have put out 3 applications of Civitas. I have been experimenting with the timing of the Civitas applications a bit. I am applying it more on a growth potential model and less on a period of time model. 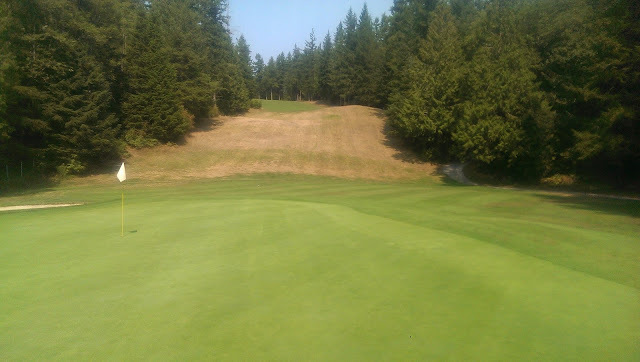 Knowing exactly what kind of growth rates and vigour I can expect from the turf allows me to make better decisions about application rates and timing. In mid Oct we were experiencing very dry, and cool temperatures which brought the growth rates down significantly. For this reason I applied a heavier rate of Civitas but stretched the next application out as the turf really wasn't growing and I wasn't removing any of the product through mowing. In Oct I cut the greens 6 times where in the first week of Nov I have already had to cut the greens 4 times due to the warmer wetter conditions. The lighter application in early Nov was due to the fact that I am again mowing like a mad man and would more than likely have to apply another application in a few weeks. Fuzzy white mycelium in Sept, my worst nightmare! Rolling! Well my great intentions of rolling all through the winter stopped on Oct 12 due to the intense deluge of rain! Since that time the conditions have just been too wet to roll especially on some of our hillier holes. It was so wet in places that even my 4wd mowers couldn't mow. Now that the precipitation has slowed down a bit I will resume rolling regularly as conditions permit. So far this fall I haven't seen any significant difference in disease pressure on my trial green but for the most part disease pressure has been very low. The crazy weather this fall taught me a few things about the two most important disease we face, Dollar spot and Fusarium. In the past people have always blamed Fusarium on the wet conditions. What I saw this September showed me that this wasn't necessarily the case, at least if you are concerned with rain. We saw the driest September in recorded history this year and sure enough as soon as the overnight temperatures started to dip below 10C fusarium showed up. What I learned is that Fusarium incidence is really more dependant on temperatures and less so on moisture. Of course standing moisture (dew) and excessively wet conditions don't help but my observations were that infection still occurred in the absence of rain. It was especially bad in areas that were shaded (big surprise eh?). Is he growing grass or Dollar spot? Dollar spot was completely the opposite. I was always more concerned about the temperature than moisture with this disease. Turns out I was wrong again. The dollar spot severity in September was like nothing I had ever seen before, especially on fairways. We have a very difficult time keeping our fairways moist as we don't use any wetting agents and the areas that were the driest were the hardest hit. You could literally see the dollar spot from hundreds of yards away! Yellow Patch! On the greens that didn't receive the Triton application in Sept the yellow patch has been crazy! I have always seen quite a bit of this disease but nothing like what I am seeing right now. These greens haven't received any traditional pesticides since May and it is really starting to show! I could be the first superintendent in history to actually worry about yellow patch! It is really cool to see on the few greens that get the most sun how little disease there really is and it just reinforces to me the importance of providing full sun to the putting greens if you want to reduce your pesticide use. If all my greens had as much sun as my 6th green I could easily get by with Civitas alone with maybe one application of a traditional pesticide in the early spring. It is really too bad that trees have been included as part of the golf course design especially around the putting greens. It is really hard to convince everyone that they need to be removed. Sadly this is the best solution. Here are a few videos I shot on Nov 08 around 11am showing the current disease conditions on my putting greens. Yellow Patch Attacks! Lesson Learned.